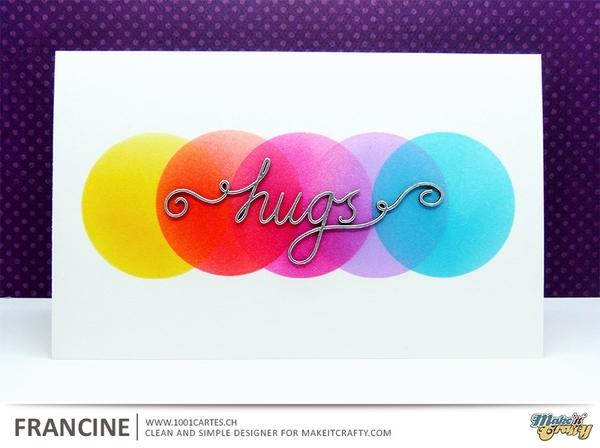 These chipboard words are just perfect to add a special touch to a project. I decided to use the word "Hugs" without any colored image. I heat embossed the chipboard with silver embossing powder to give a metallic look. For the background, I made a homemade stencil and sponged dye inks over it to create a rainbow. Don’t forget our CAS May challenge! It’s all about backgrounds. You can enter your projects HERE! So simpel und soo schön! Einfach toll! These colors are so beautiful, love this. Ich liebe diese Karte so sehr, sie ist einfach nur GENIAL! The circle-rainbow is just amazing! So gorgeous and I love the silver sentiment against all those yummy and vivid colors!! You did an excellent job on this card - so amazing! !